A smaller, lower cost version of the Rex Log Saw 1050, this firewood docking saw is a very productive hydraulic drive chain saw capable of cutting 800mm diameter logs. The unique log infeed system handles all logs – including bent logs – capably. With low running costs, minimal labour input and high production output it is considered to be extremely efficient, giving a good return on your investment. 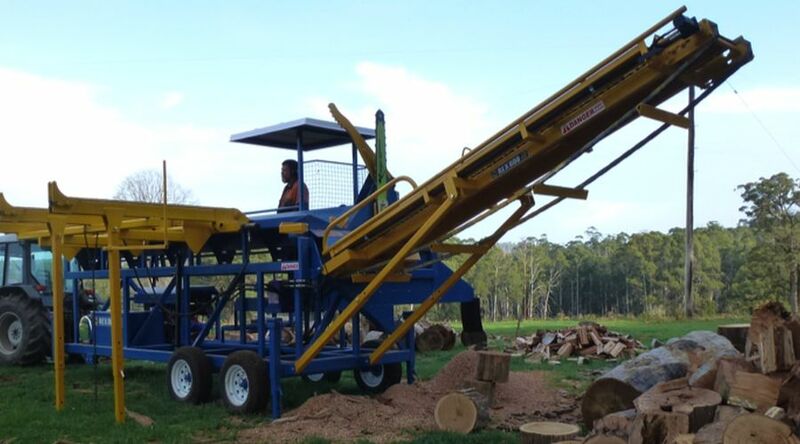 It is designed to work in conjunction with the Rex 600X Firewood Processor where cut blocks drop directly into the Rex 600X hopper for processing into firewood. An optional block conveyor is available for loading blocks into the Rex900, or stockpiling/ truck loading. The Rex Log Saw 800 is a fully self-contained unit. 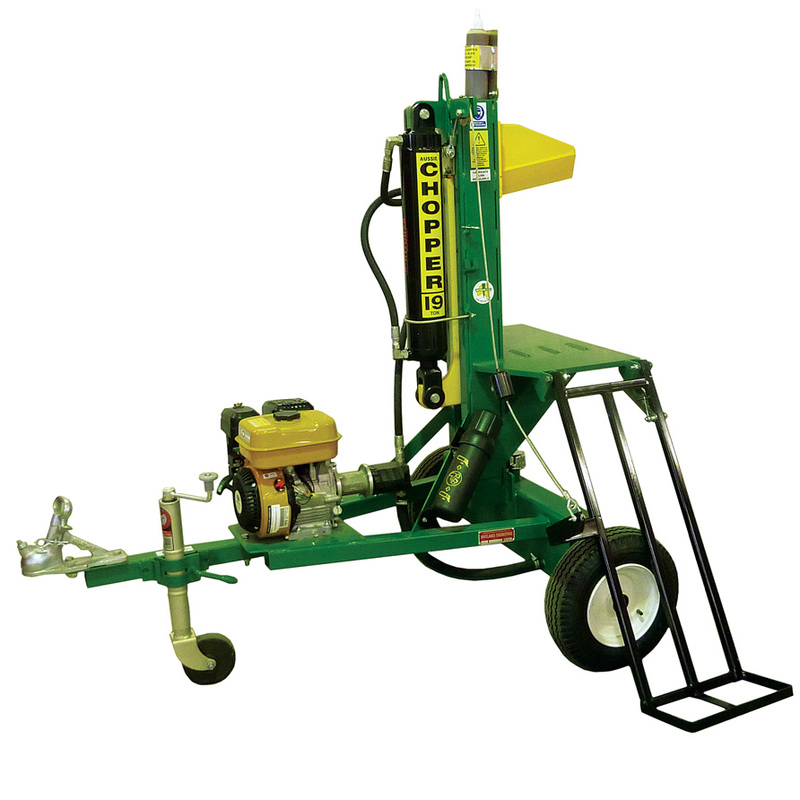 The 43 inch chain saw bar is hydraulically driven from the 50hp Yanmar diesel. Logs are loaded onto the log deck with a loader, fed into the trough using a hydraulic chain drive system and then fed into the saw head using a unique log pusher system. An increment system ensures even block length and blocked timber is carried away by the 5m conveyer for splitting or stockpiling. Importantly, the operator’s working environment is safe, as they are well clear of the saw zone. This machine is WorkCover compliant making it ideal for firewood businesses who are seeking to reduce their liability. Designed with a well specified hydraulic system, and built with quality components (and minimal electronics), the Rex Log Saw 800 will give thousands of hours of trouble free operation. The Rex Log Saw 800 will cut your labour costs, increase productivity and eliminate Work Cover issues. PRODUCTION POSSIBILITY: One operator is capable of processing in excess of 120 cubic meters of logs per day (guide only). Similar running costs to one chainsaw with three times the output. 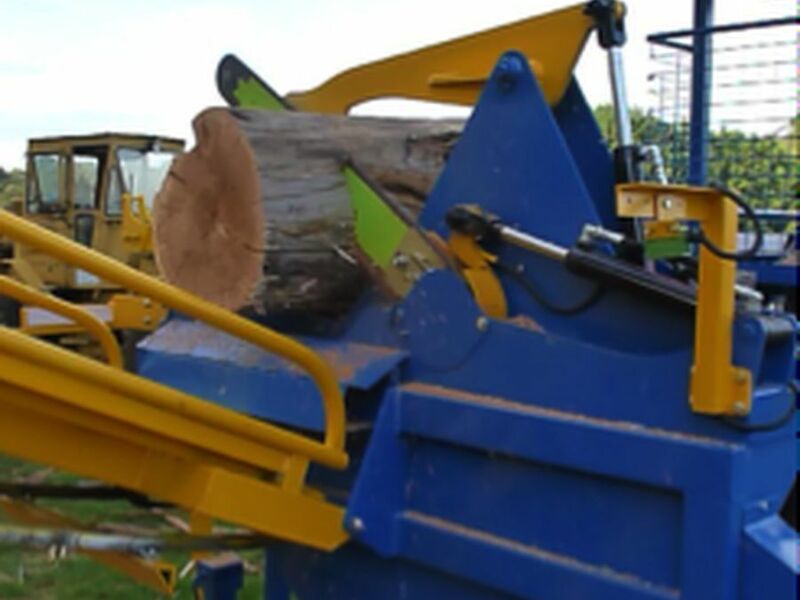 CAPACITY: Will cut logs up to 800mm diameter & from 1.5m – 6m long. LOG DECK: Large ‘live’ log deck with 3 chains. Includes log stop/roll and log deck lift features.